If you are really a watch lover then this Casio Pro Trek Smart WSD-F20 expert verdict is only for you. Just forget about that normal watches which tell you only time. Just take a look at this awesome Casio Trek Smartwatch. Due to this new generation and technology world, everything is changing fastly. So just learn to walk with the trend. Casio Pro Trek Smart WSD-F20 is the replacement of Casio Smart Outdoor Watch WSD-F10 that comes with specific similar features of its predecessor, however, it is bit thinner. The major upgrade in this latest version is inbuilt GPS, that means you can take this gear outdoor without your phone. The current price tag of Casio Pro Trek Smart WSD-F20 ($500) puts it in the category of high-end smartwatches in the market. However, it would be unfair if you compare it with LG watch sport or Apple watch. Casio Pro Trek is developed for the niche segment. It is for people who are into non-Android sports watches and take their outdoor activities quite seriously. Favorably, there are not much of options in smart watches that entertain the outdoor sports enthusiast. It comes with a perfect combination of tracking for canoeing, hiking, skiing, cycling, snow sports, and fishing, etc. plus OS smart features. Google improved its smartwatch operating system with the release of Android Wear 2.0 earlier this year. It features a better-looking interface that’s easier to use; the Play Store, where you can download apps to the watch itself; and the Google Assistant, an artificially intelligent assistant you can ask to perform functions, like send a message or set a reminder. As the comparison to other Android Wear 2.0 watches, the interface is fluid, fast, and easy-to-use. Dismissing a notification makes it disappear from your phone, and you can interact with a good amount of them — such as responding to emails or replying to a Facebook message. When it comes to talking about its designing & screening you can’t compare with other watches. Its strong faux metal finish with plastic casing, paired with silver metal stud – complete with an oversized black protective bezel – makes the entire thing appear a bit like a watch wearing an iron armor. 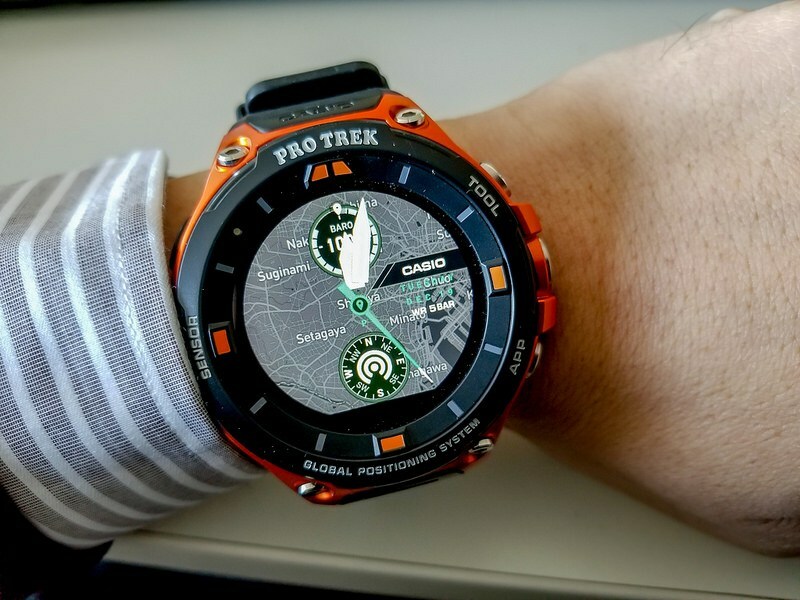 This Casio Pro Trek Smart piece is an outdoor watch. Right from its functionality to appearance – there is nothing subtle about it. In dimensions it is huge – 6.17 x 56.4 x 15.7mm. As compared to its rivals Garmin Fenix 5X and Suunto Traverse, it is quite bulky and attention gainer. When you look beyond its large bezel, there is dual layer touchscreen display of 1.32 inch that is fast, responsive that delivers smooth transitions between features and screens. It can also be cleverly flicked between monochrome and color for better power saving. It is admired for this batter conversation feature, but that is the only USP of its screen. However, according to the expert reviews during daylight, it is almost impossible to read, though it comes with five levels of adjustable brightness. This is one huge issue with outdoor watches that Casio Pro Trek Smart also fails to address. As compared to its competitors Garmin Fenix 5 (weigh 82 grams) or Suunto Traverse (weight 80 grams), Casio Pro Trek Smart is heavier weighing 92 grams. Being an outdoor trek watch, it is built sturdy so you cannot expect much of comfort fit around your wrist. It comes with rigid standard and inflexible band. To avoid any accidental shutdown, the Power Button is guarded by two buttons. The function of the power button is also to returns you to the home screen. Meanwhile the App and Tool buttons can be assigned to different purposes, but initially, the App button launches the maps and Tool loads the compass. One fantastic feature that is appreciated in this piece is a built-in mic that lets to take and store the notes in your current location. For inspiration, it is quite a lovely feature included by Casio. If you are looking for must-have outdoor trek watch, then Casio Pro Trek Smart is undoubtedly an excellent piece to buy. However, its hefty price tag makes it little less worthy as compared to its rivals. These all features are enough to make this watch extraordinary. The price of this watch is bit extra than other watches but according to positive reviews from all over the internet makes it worth.